Dementia is the progressive loss of cognitive and emotional functions such as thinking, memory, and reasoning severe enough to interfere with daily life and resulting in changing behaviors. By 2050, the prevalence may triple. With the increase in the aging population, there is a concomitant rise in dementia and a critical need for dementia education for ALL! There is great concern about being diagnosed with Alzheimer disease and/or possibly having to care for someone who develops Alzheimer disease and related dementias. Most Americans feel uninformed and fearful of the disease. 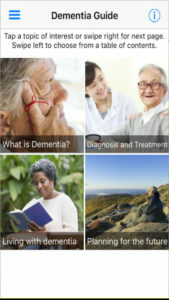 There is a need for education for all adults about Alzheimer disease and related dementias. 2. Anderson LA, Day KL, Beard RL, Reed PS, Wu B. The public’s perceptions about cognitive health and Alzheimer’s disease among the U.S. population: a national review. The Gerontologist. Jun 2009;49 Suppl 1:S3-11. 3. Hebert LE, Weuve J, Scherr PA, Evans DA. Alzheimer disease in the United States (2010-2050) estimated using the 2010 census. Neurology. May 7 2013;80(19):1778-1783. 4. Hebert LE, Scherr PA, Beckett LA, et al. Age-specific incidence of Alzheimer’s disease in a community population. Jama. May 3 1995;273(17):1354-1359.